Soaking wet from rain and sweat, the 14 year-old starting pitcher from my junior high school seemed almost nonchalant walking off the field. By his expression, you would have never guessed that his team just won a thrilling 13 inning affair, thanks in large part to his right arm and all 173 pitches. That’s right, 173 pitches… from a 14 year-old. 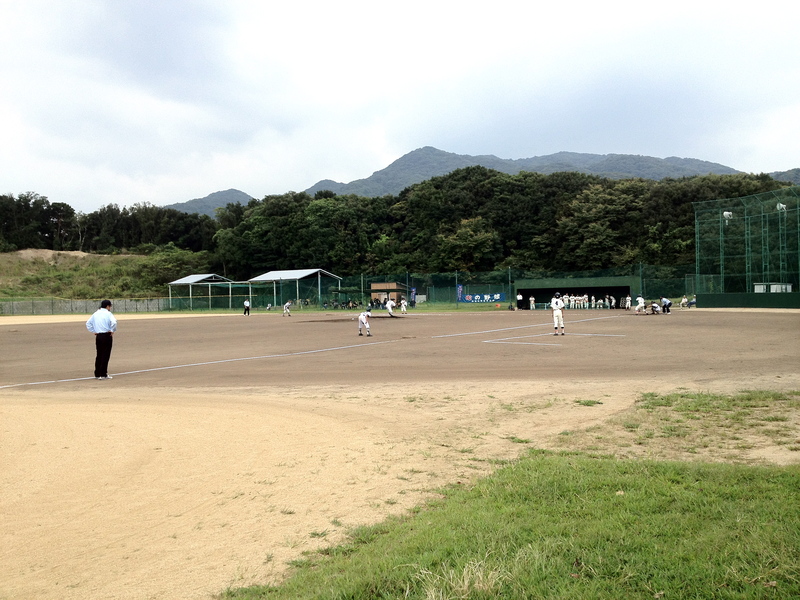 In front of a fan base consisting of the school’s principle, player’s friends, player’s moms, and only four of the player’s dads (yes I counted the stands) my Junior High School completed a come-from-behind, extra inning victory, over the defending Awaji Island champions. You always here about the discipline, hard work, and focus that young Japanese ball players posses, but you never realize the extent of it until you witness it first hand. Well, after watching these 13-15 year olds grind out 13 innings under passing showers, I can confidently say that I have never seen anything like it before. From the players bowing to each other prior to first pitch, from the opposing team raking the infield dirt, to one team even singing and clapping chants for each individual player, it was clear that Japan takes their baseball seriously. During the game I took notes on all action around me. The following consists of my observations as well as a scoring summary. The game gets pretty dramatic at the end! The coach just called for a bunt with runners on first and second and no outs during the first inning, with his number three hitter up. I cannot find any logic in this. He’s batting third in your order for a reason; to drive in runs! Your three hitter is your best hitter. Why take the bat out of his hands and make him bunt. I understand the whole small ball scenario and wanting to score first, but this should never be done in baseball. After a failed bunt attempt he struck out. The next batter grounded out, and the fifth hitter of the inning struck out. So after getting the first to men on base, Higashiura comes away with no runs. Observation: At the end of the inning, the pitcher placed the ball perfectly in the dug out hole in front of the pitching rubber. Even after a striking out the last batter, the catcher still threw the ball back to the pitcher to perfectly place the ball on the mound for the visiting pitcher. In ‘Murica, we always just rolled it to the general vicinity of the mound. In fact, last summer when I interned in the press box for the Frisco RoughRiders, home of the Rangers AA team, we would play a game every half inning to see if the ball would roll to the center of the mound. If you payed that in Japan, you would win every time. Observation: The Higashiura starting pitcher threw in the bullpen every inning when his team batted. This is very different than baseball back in the states. If you’re the pitcher and your team is hitting, you are supposed to rest inside the dugout and preserve your energy. Heading into the last inning before extras, and it’s still knotted up at zero. Both pitchers have been phenomenal. After a double just out of the reach of the lunging center fielder, the Higashiura coach calls a team meeting with the entire infield huddled around the pitchers mound. During this little break, I was given a yakisoba sandwich by one of my students, and some ice coffee by on the the players moms. As you might have guessed, Japan is the most hospitable place in the world. As the starting pitcher continued to throw lightly on the side while his team batted, a faint smell of a cigarette filled the air around the Higashiura cheering section. I guess in Japan, smoking on school grounds is allowed. It was still deadlocked at zero, and players on defense continued to yell “fue!” (let’s go!) before each pitch. Unfortunately, Higashiura was unable to score. We’re headed to extras! Deuces wild! (2 balls, 2 strikes, 2 outs) The winning run is on second, and none of the fans are cheering. What is going on here?! Your pitcher is one strike away from ending the inning. Cheer him on! Maybe they all just want to go home already. Again, Higashiura pitches out of a jam and escapes the inning unscathed, just in time for the rain to begin. After a lead off walk, a swinging bunt advanced the runner to second. Later, a grounder to third baseman advanced the baserunner to third. So now there are two outs with the winning run on third. It looks like Higashiura’s luck is running out; the winning run is just 90 feet away. However, the young pitcher reared back and fired a fastball by the batter. Strike three! For the second consecutive inning, the opposing team strands a runner in scoring position. It’s still locked at zero. Both teams still have their starting pitchers in. These kids can flat out play. Interestingly, the inning started off with the bases loaded. It must be a rule to start the inning with the bases loaded if the score remains tied after nine innings. The first Higashiura hitter smacked a line drive right at the right fielder. It was plenty deep for the runner on third to tag and score. However, the runner didn’t tag right away! After scampering back to the bag well after the catch, he then decided to tag. But since he didn’t tag immediately, he was out by a mile at the plate. Score that a 9-4-2 double play. That definitely killed the momentum, as the next hitter grounded out to end the inning. Amazingly, all it took was just three pitches to get out of the baseball loaded, no out situation. As expected, the inning started off with the bases loaded. Not expected was for the first pitch of inning to result in a double play back to the pitcher who threw the ball to home for the first out, followed by the catcher throwing to first for the second out. Wow, can these kids execute! This rally killing play finally brought some life into the crowd as fans began to get loud and cheer. The first batter trickled a ground ball to first, but the first baseman bobbled it. That caused the first run of the game to score. During the next at bat, the runner on third got thrown out by the catcher for being too far off the base on a missed hit and run. But it was not the hitters fault. He physically left his feet to lunge at the outside pitch. Eventually, Higashiura plated a second run to make it 2-0. During this half inning, I was surprised to see the starting pitcher still playing barehanded catch while his team batted. He hasn’t taken a break the entire game! Also, it took me until now to realize that players coach first and third. That could explain why the runner on third didn’t tag right away during the previous inning. The visiting batter ripped a line drive right back to the pitcher, who fired to third for the double play! In my opinion, that was the turning point of the day. All the momentum shifted to Higashiura, right there. The pitcher quickly got ahead of the next hitter 0-2 before blowing a fast ball by him. We head to the 13th tied at two. Is this a great game or what? On a full count, the lead off man laced a two RBI single to left to make it 4-2. After a strike out, an incredible running shoelace catch by the right fielder doubled off the runner on second to end the inning. And we head to the bottom of the 14th. By now, they have played almost 2 full games, with the same pitcher still in for both teams. I really wish I knew his pitch count. It must be approaching Daisuke Matsuzaka’s historic 250 pitch performance in the 1998 Summer Koshien quarterfinal game. 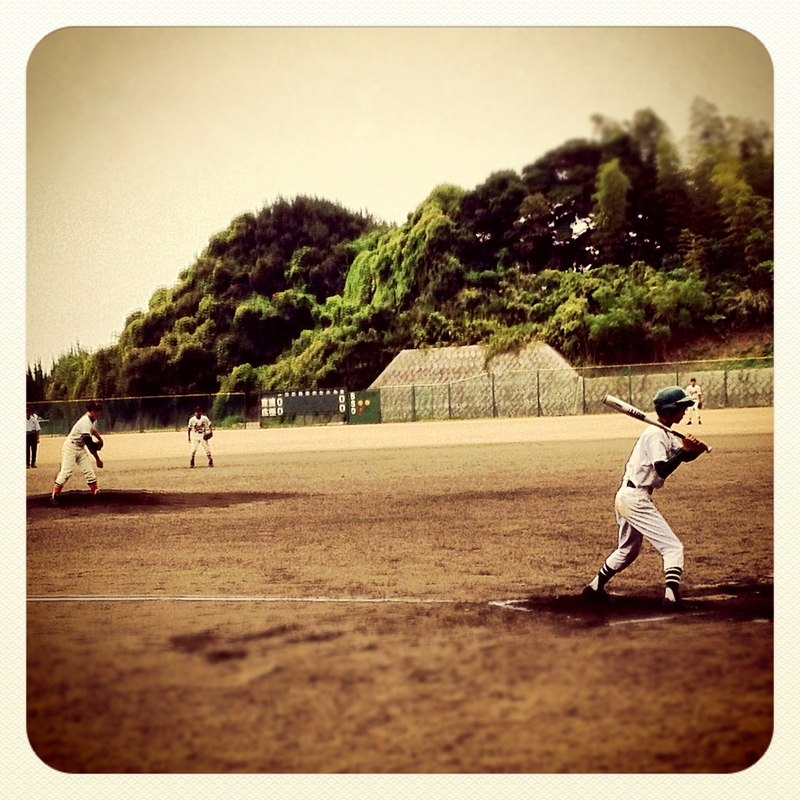 The Summer Koshien is a high school tournament, equivalent to NCAA March Madness in the states. For you non baseball fans, anything over 120 pitches for a major league pitcher is considered A LOT, and is very rare to see. The inning started with a ground ball deep in the hole between short and second that scored two runs to tie it up at four. The second run could have possibly been prevented, as the catcher dropped the ball as the runner slid in. But it was too close to tell if he would have been safe, even if the catcher held on to it. At this point during the game, I again felt that it was over for Higashiura. The winning run was on third and the batter had a 2-0 count. Maybe my time as a 2012 Red Sox fan has made me pessimistic, but I really thought Higashiura was done. Amazingly, the Higashiura catcher made up for his error and back picked to third causing the runner, representing the game winning run, to get into a pickle. This was it. Any miscue by a Higashiura fielder would result in a loss, as it would allow the winning run to cross the plate. At this point, I was standing, pressed up against the netted fence that lined the perimeter of the field. Close to four hours of watching baseball came down to this one play. The base runner sprints back and forth like a crazy man between third and victory awaiting him home plate. But, after ten seconds of being in a pickle he gets thrown out at the dish. The fans go crazy! This has to be one of the most exciting games I’ve ever watched. However, Higashiura sill needed two more outs to escape the jam. So on a 1-1 pitch the opposing team tried a hit and run. Higashiura must have known it was coming as the pitch was way outside, causing the batter to swing and a miss. Miraculously, the catcher was able to back pick the runner at third. So now there are two outs and two strikes. Higashiura is one strike away from forcing a 14th inning. The pitch, strike three! Inning over. This game is ridiculous. On to the 14th. After leading off the inning with a strike out, the second batter roped a two run double to give Higashiura a 6-4 advantage. After a failed suicide squeeze, there were two outs. And the next hitter grounded out to end the inning. We head to the bottom if the 14th with Higashiura leading, 6-4. As we enter the final frame, fans yelled “Gambare!” (good luck/do your best), and players from their respected teams all came out of the dugout to stand and watch. The first batter popped out to first. The second batter struck out swinging on a nasty curve. Now, after being 90 feet away from losing on three separate occasions, Higashiura was one out away from escaping from the jaws of defeat. Higashiura’s starting pitcher toe’s the rubber. He gets the sign. The pitch. Ground ball to first. He has it, steps on the bag. Ball game over. Higashiura wins! Go crazy folks! Okay, well maybe there wasn’t champaign bottles popping, but it was still a dramatic finish. 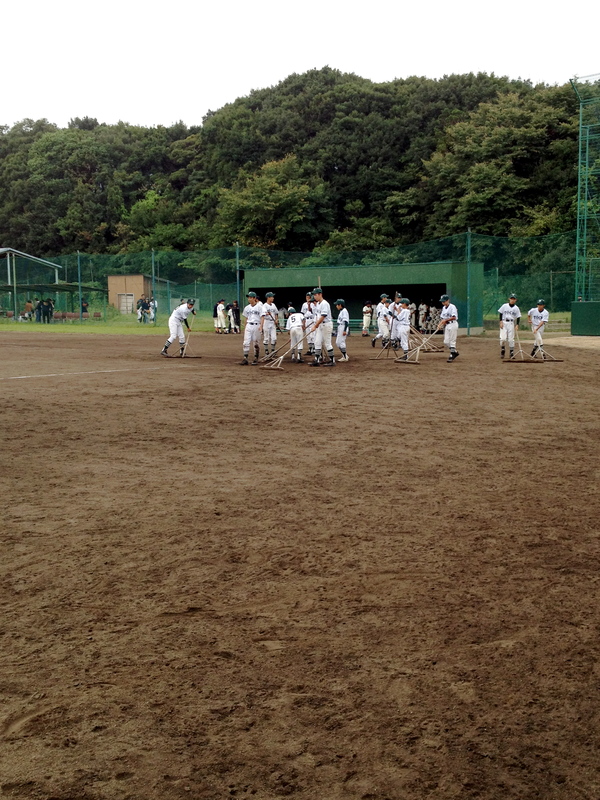 The final line: Higashiura 6, Visitors 4. Game time: 4 hours. Attendance: About 40. As for Higashiura’s starting pitcher, he casually exited the field with two different slings on his arm to go along with one massive bag of ice wrapped around his elbow. For him it seemed like just another day playing baseball. But for me, it was the best amateur game that I have ever witnessed. This entry was posted in Baseball, Culture, Life on Awaji, Video and tagged Awaji, Baseball, Daisuke Matsuzaka, Higashiura, Japanese baseball, yaki soba. Bookmark the permalink. Steve, you are the coolest. Brad, you taught me everything I know about being cool.